The SR4C is a 1-4x22 LPV (low power variable) optic which has a 4MOA daytime visible red dot, features the SR4C reticle in MIL scale. 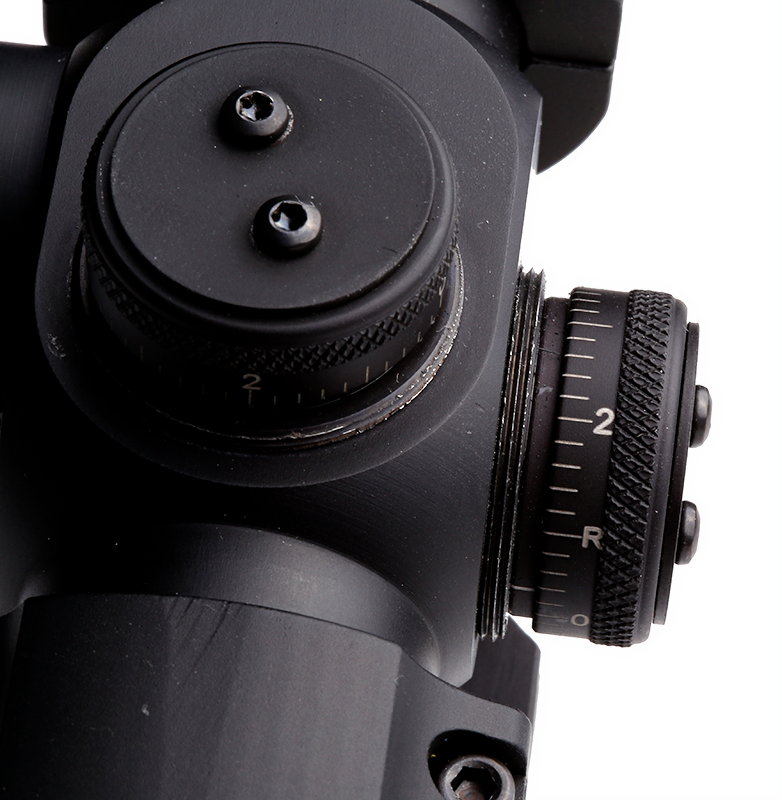 The Zeroing knobs are 2/10MIL per click adjustment and the eyepiece is adjustable with a +2 to -3 diopter for sharp focus. 22mm objective at 1x and a 32mm eyepiece which yields a 6.23mm exit pupil. 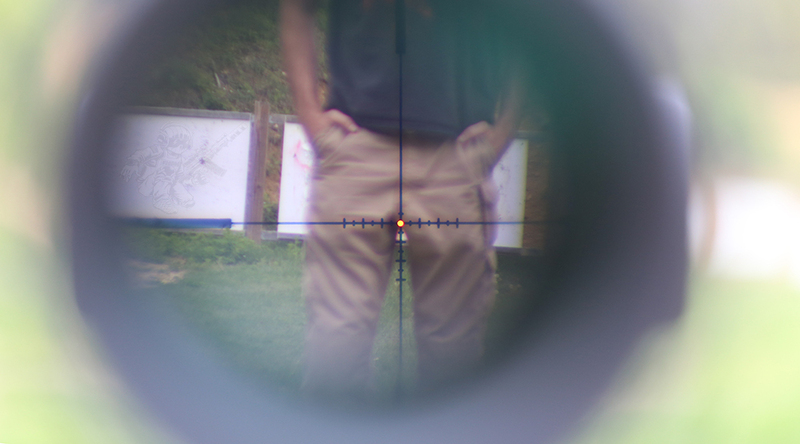 1X magnification FOV (field of view) at 100 yards spans 110 feet. Case is made out of 6061-T6 Aluminum and it accepts CR2032 batteries. The entire optic, sans mount, weighs around 1.25 lbs. I purchased this optic around January of 2015 directly from USOptics for an LE price of just under $2,000. 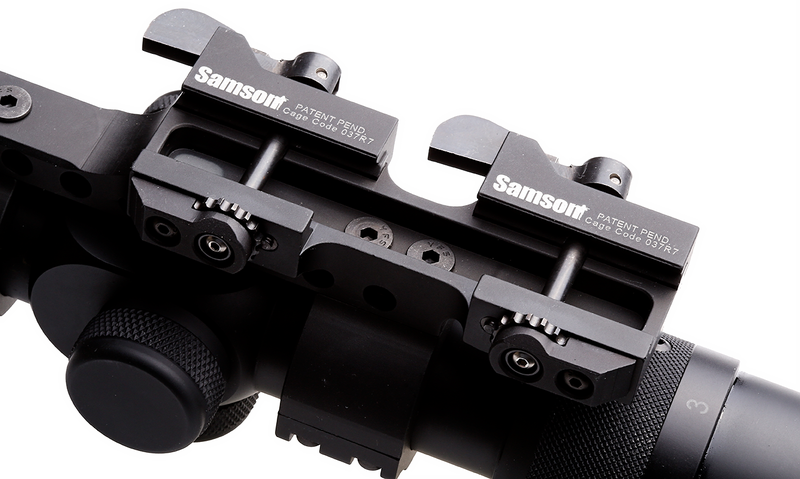 The Samson 30mm DMR Mount is made out of 6061-T6 Aluminum, has two positive locking latches and can be operated one handed. Completely tool-less and is designed to work with any picatinny rail. I purchased directly from Samson shortly after my purchase of the SR4C for retail price. 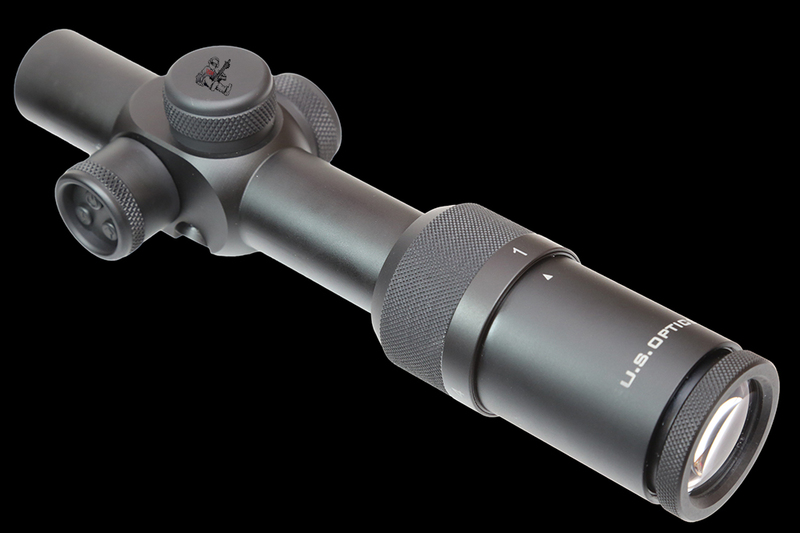 I knew I was going to have to pass on the USOptics SR8C which I was given to evaluate and review. Having spent some time with the SR8C MIL reticle, running in various classes like the Dual Role Carbine taught by F2S, I knew I wanted a USO optic with that reticle. I ended up buying the SR4C 1-4x because I wanted an LPV to run on an SBR. 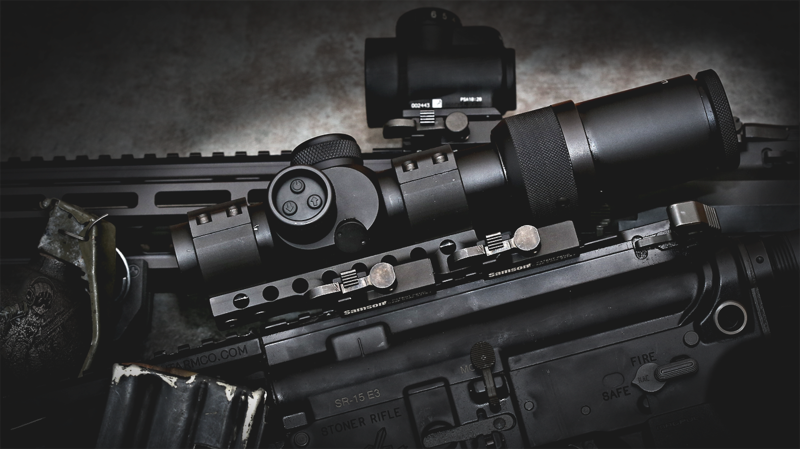 The Samson 30mm DMR mount was on my shortlist for optic mounts which I wanted to try, especially as I was given the opportunity to be part of Samson's Operation X. This particular 30mm mount is very robust and not minimal in any sense. 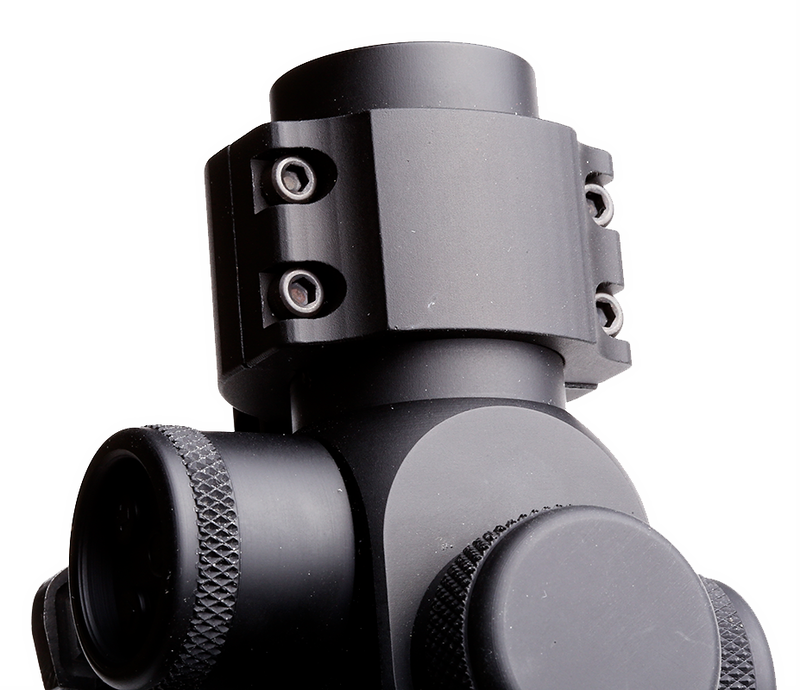 It is a very robust mount, which I wanted for a similarly constructed optic. The SR4C has the same feel as its bigger brother the SR8C. Right out of the box I could tell that the optic was going give me more worth than I originally imagined from a 1-4x. At 1X the optic was extremely clear and as close to 1x as an LPV can ever get to. (None of them are truly 1x, but they can be extremely close) The magnification adjustment was tight and required effort to turn, which meant it would not bump out of place if hit, even hard. 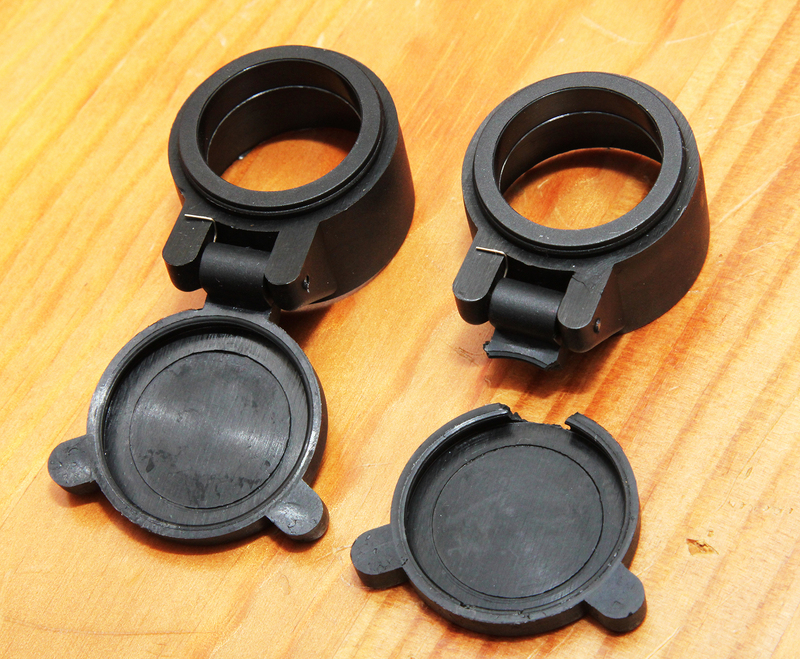 The focus ring eyepiece was also the same way. Very difficult to move and stayed at the proper focus point once set. I usually put some tape on it, or another mark, but in this case I did not need to and honestly I expected not to as the optic is the most premium 1-4x on the market at the time I purchased it. 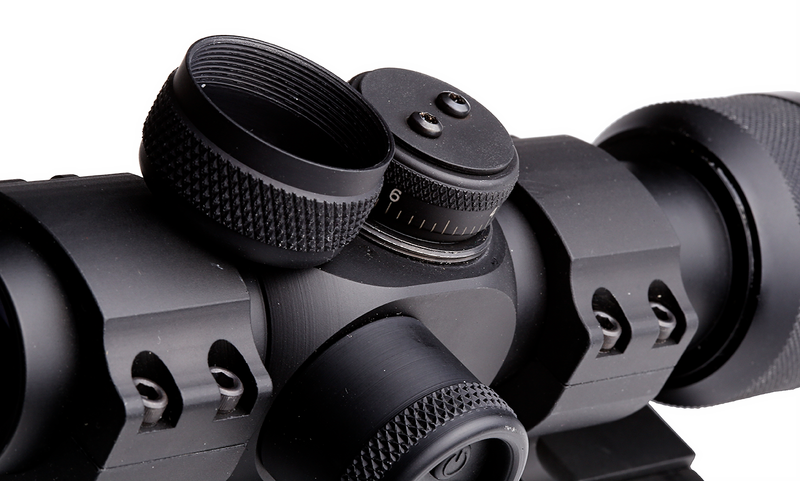 Both turrets are capped with a hard aluminum cap which can be hand tightened onto the optic. 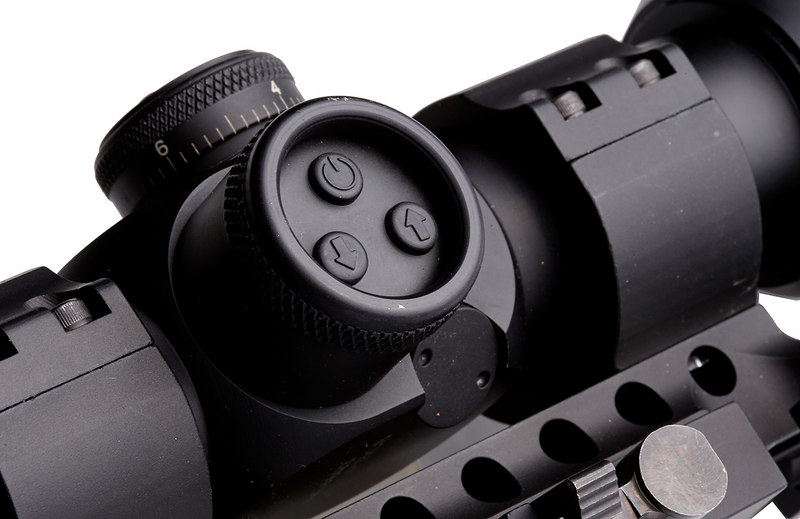 Once the zero is set, you can tighten the cap and have peace of mind that the optics turrets are protected. This design is the best type I have seen as it works so well. 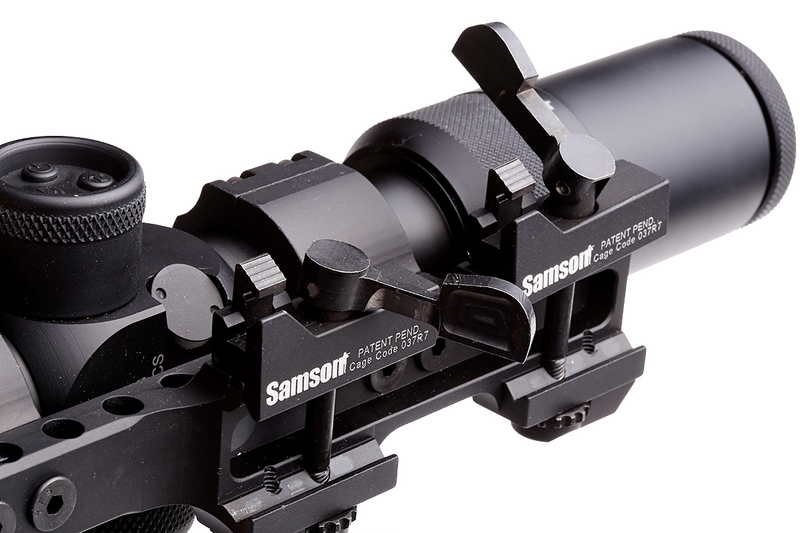 The Samson mount was extremely easy to put together and install the SR4C into. I used the Arisaka Defense small optic Leveler to properly install it and had zero issues otherwise. Following the provided instructions the optic installed easily and securely. I had the SR4C on my PWS Diablo for a while, carrying it in a Vertx Gamut and i quickly realized that the flip up lens covers were not made for that type of application. I posted about one of them completely breaking off. I contact USO who sent me replacement flip up covers immediately with no requirements to send back the broken covers. 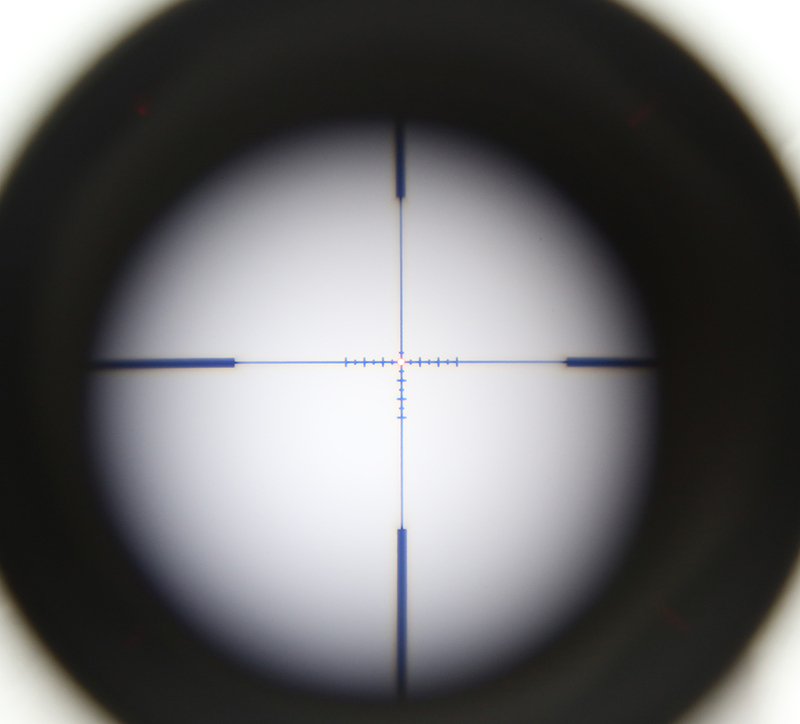 The real beauty of the SR4C is the reticle. It is created specifically for using MIL ranging and size estimation of a possibly known sized target (usually an adult male or animal of a known size). The MIL hashes work exceedingly well for this particular application. 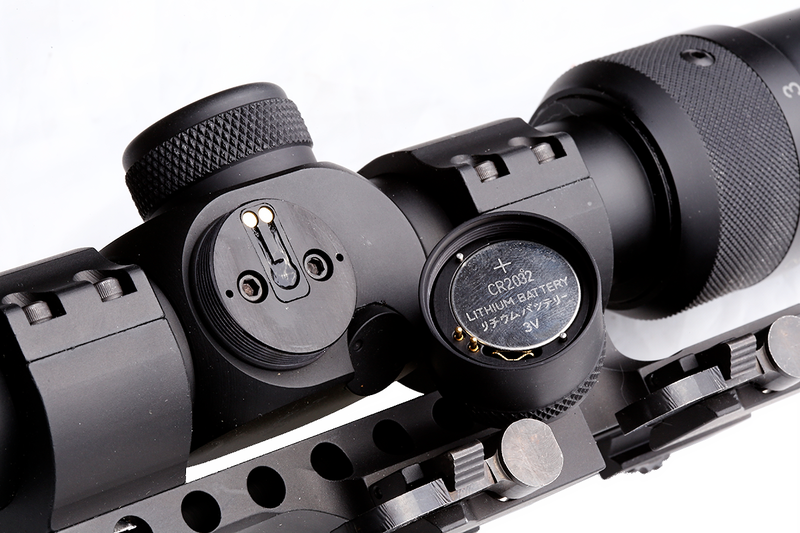 Unlike other MIL/MIL Reticles, this one is clearly visible at distances and easy to read. There are a lot of resources available for those who want to learn how to use various reticles at various distances and I would highly recommend taking a class with a vetted instructor who is known for not only understanding the math behind this whole thing but able to teach you how to use your equipment properly. Who am I talking about? Bill Rapier, Kyle Defoor and Jack Leuba are those instructors. 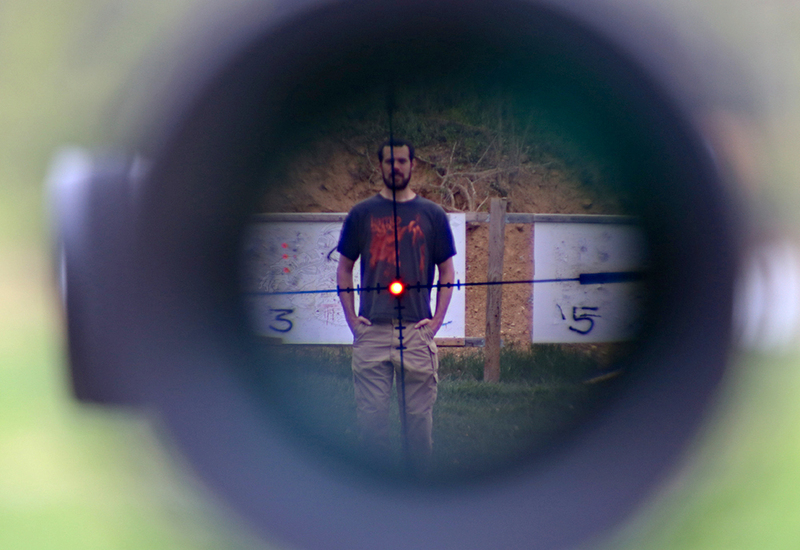 I posted an article on Optics, Reticles, PID vs. Distance and I used this SR4C to show what it is capable of at various distances. The above is 1x magnification at 25 yards with the red dot brightness at maximum brightness. This was a very sunny day. At 50 yards, maximum brightness of the red dot and you can clearly make out the MIL/MIL hashes. At 75 yards, maximum brightness of the red dot and you can clearly make out the MIL/MIL hashes. I did not get a chance to take photos further out but the I can say without hesitation that the MIL/MIL hashes are clearly visible and clearly functional for ranging/estimation application. The adjustment settings were very easy to use and once tightened into place stayed there without any movement. Every time I confirmed zero or made adjustments I could go back to the set zero and it would always be set without deviation. The three button digital controls worked well. Long-press on the power to turn off and short press to turn on. Up/down red dot brightness was easy to manipulate and it would double blink once at maximum. Zero issues with this. I changed the battery once and it was pretty easy to do so. The aluminum construction allowed for a firm and tight connection. I checked the zero of the the Samson mount several times throughout its use. The optic always came back to zero and the adjustments were very easy to make. There is extremely little this optic has in ways of negatives. Yes it did have some problems which were taken care of by USO very promptly and after wards I put north of 15,000 rounds through AR15's with this optic on them. I used it as a quick RDS type optic at some points and at 4x the MIL/MIL reticle is fantastic. I am a big fan of its function and visibility at distance. The battery life is sufficient and it uses the same CR2032 which other optics use (like the Aimpoint T1 ), so I have a bunch of them already. 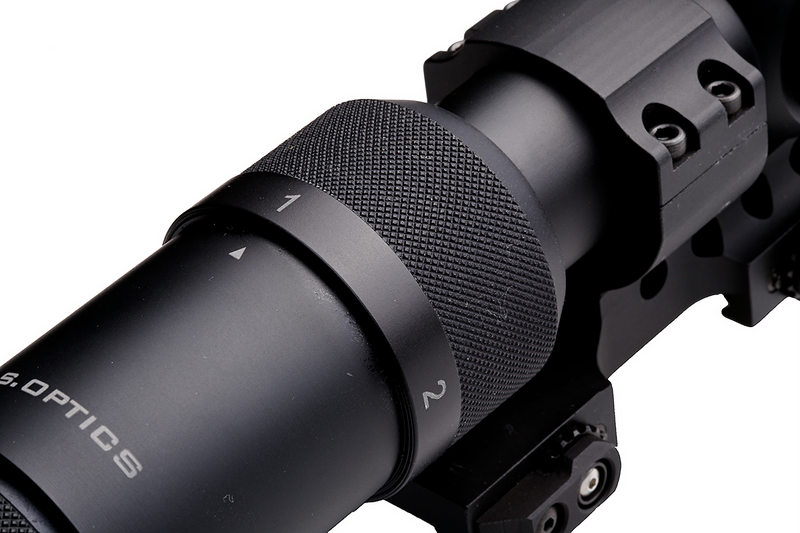 The versatility of the optic and its robustness are a direct reflection of its price point. 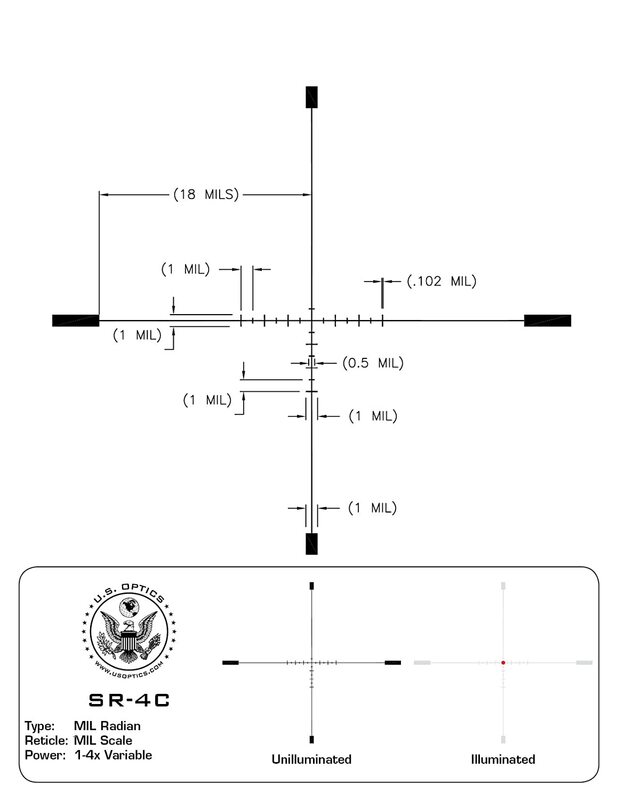 USOptics discontinued the SR4C as well as other optics which they produced. This is not a negative reflection of this optic, it is a reflection of the evolution and progress of their product. Currently the only way to purchase an SR4C is finding a new one sitting on a shelf somewhere or getting it used. Going rates for one without a mount is around $1600 as I have seem them currently. Most keep these optics as they are fantastic and finding another 1-4x with the same build quality and reticle is very difficult. The question I always get when people see this optic is "why does it cost so much more than other 1-4x optics?" The answer is not just in the build quality but the details of every aspect of the optic itself. The glass is the best I have seen and only comparable to the Swarovski Z6i . There is no noticeable distortion or vignette at magnification. 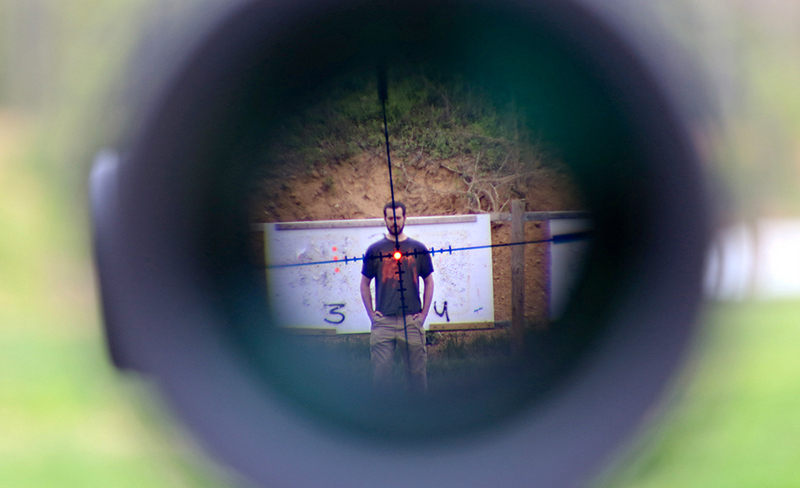 The reticle is superb and the red dot is on par with any out of the box Aimpoint 4MOA RDS. 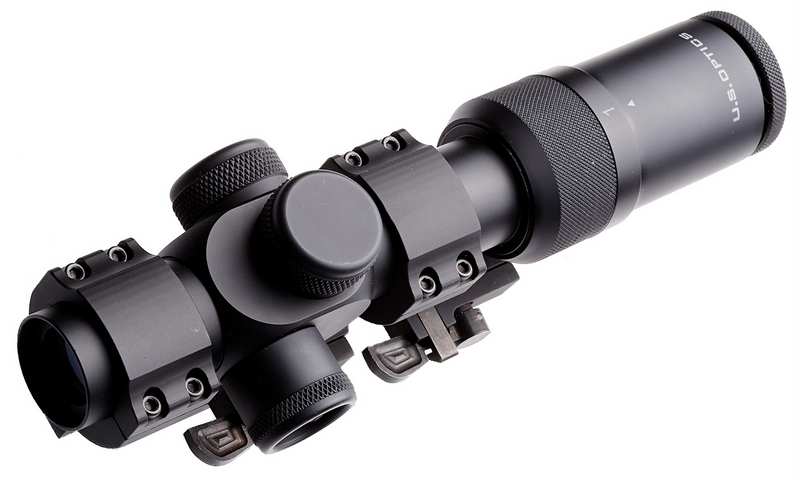 I have shot and owned dozens of optics, the quality of this one is indicative of its overall price. I also hear "why wouldn't I just a 1-6x for the same price?" Well yeah, you could. At the time this optic was released there were no real competitors for it in the 1-6x market. Now a days there are a few but they lack a few minor detail points such as overall build quality, or some of them have open capped turrets (which is an instant DQ for serious use) and some do not have a red dot which is even remotely comparable. The SR4C bridged the gap between RDS and LPV, not by a little bit, but by a lot. In my opinion, for it's configuration at the time, it was the gold standard of LPV optics and at this point in time bests any 1-4x and takes on most 1-6x optics with ease. 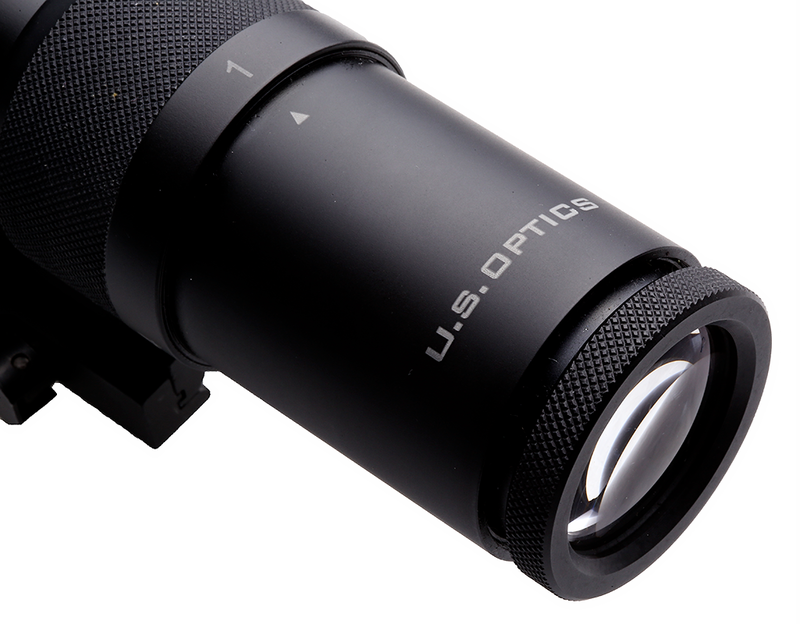 USOptics, as a company, is extremely well known for their quality and attention to detail. They fixed any issue I had with quick communication and while the SR4C is currently discontinued I do not doubt for a moment that they are done with the LPV market. I am confident that they will be releasing a very similar evolution sooner than later. The Samson 30mm DMR is a very serious mount, which weighs in at around 8.8 oz which is 1.6oz more than the standard Geissele 30mm mount . 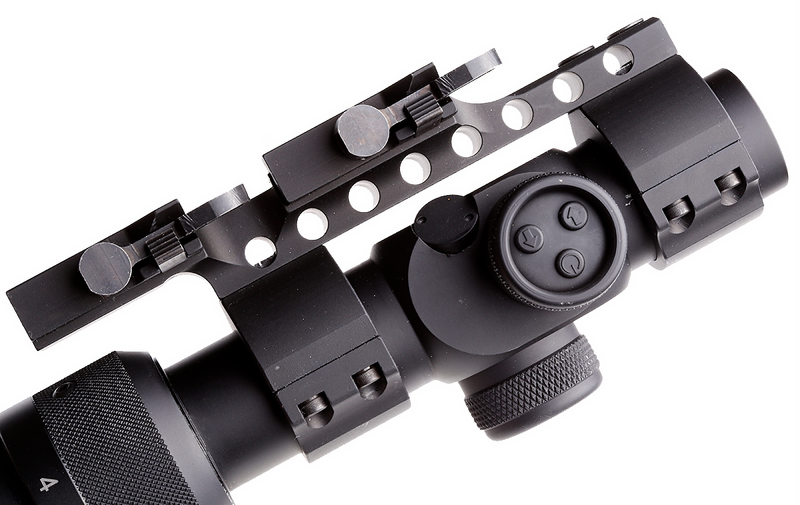 The dual levers can be made to be extremely tight clamping and allows modularity which other mounts simply to do in terms of overall QD function. I reviewed a Bobro 30mm mount previously and while the Samson mount is pretty good, I would take the Bobro over it without much thought. As of this post I have not thoroughly tested the Geissele 30mm mount, but it is on the list and may be my next mount for the next optic I test. For many of the QD mount systems it really comes down to personal preference over specifications and while Samson works well and they do have a pretty good following of shooters (and they should they make very good quality products), for me I found the Samson mount to be not as slick as I would have liked. If you are a 3-gun gamer or someone who carries their rifles in a box of some kind then sure, this is probably a good mount for you. If you carry your rifle for work or use it with a sling around kit/PC with random stuff hanging off, you may get the mount snagged (I did a few times) and while that is not really a deal breaker it may be one people want to steer clear of.